I think it's fun to send Valentines, just as a little something to brighten someone's day! If you have small children in your "world" (nieces, nephews, etc.) it's cute to send them something in the mail. Kids LOVE mail. I can remember getting secret valentines in the mail as a young child, sent by older cousins and being SO excited. It's also a bit of fun to send a card to friends (single or not) and to have a thoughtful card for someone special. Here's my round-ups of cute (and FREE) Valentines cards and tags! 1. Perfect for kids! These are the printable Valentines that I sent in the mail last year from pumpkins and posies. I particularly love the "I'm wild about you"! 2. I came across these "how do I love thee" cards from EAB Designs recently and thought they were fantastic - you could hide them around the house for a loved-one to find. 3. Kiki creates has these little printable lovelies on her site. What's your favourite? I particularly like the "love arithmetic" - you+ me=awesome! 5. 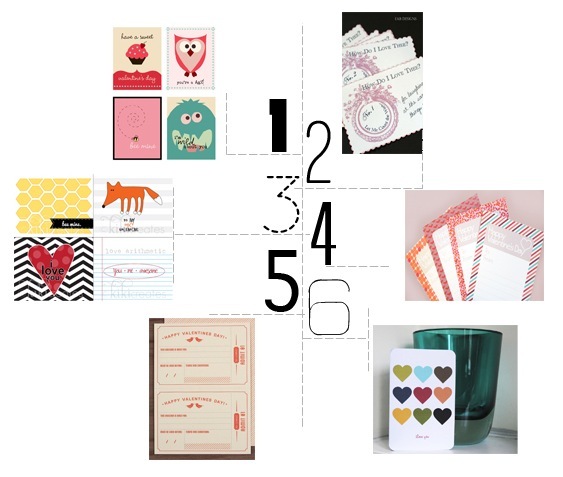 For a customizable option, these printable Valentines coupons from Love Vs. Design are gorgeous. Now that I've discovered their site, they have so many GREAT printables - I will feature some more in the future! 6. The green gal offers this free printable - a simple "love you" message with a non-traditional colour palette makes it nice for the men in your life. ...and if you want to know what Valentine idea I'm using this year, I'm not revealing until next week (because my husband reads my blog!) so you'll just have to wait and see! Oh my gosh, these are so cool! Thanks for including my little printable :) Now my printer is going to be very unhappy with the amount of printing I want to do today...Thanks for including me!